I head home on Tuesday, just in time to catch the last night of Chanukah 'en famille,' followed by my grandmother's 90th birthday. Considering this time last year, it will feel great to spend some happy, celebratory time together as a family, filled with good food and wine, laughter and probably some highly inappropriate dinner table conversations. I can't wait. With the last night of Chanukah and Christmas fast approaching, I wanted to post a recipe that could swing both ways -- ideal for Chanukah, but perfectly suitable as a Christmas side as well. 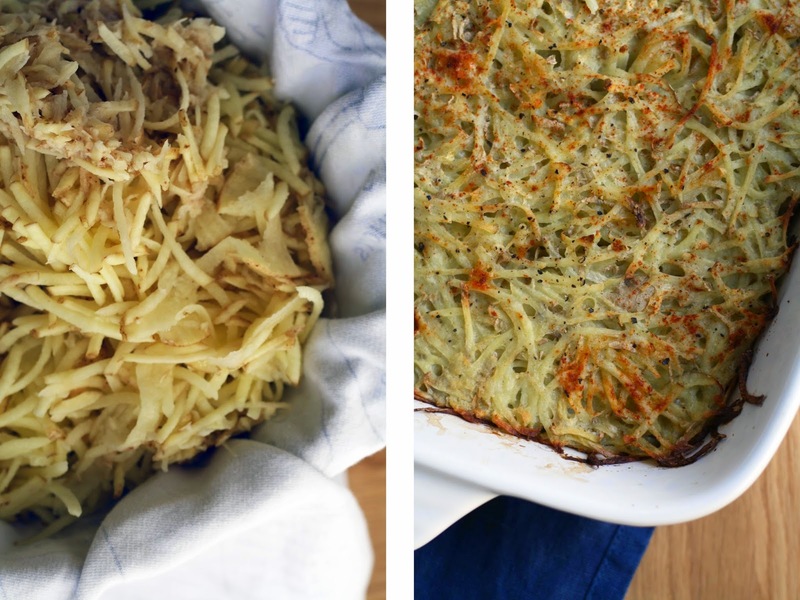 Consider this dish to be a happy medium between latkes and scalloped potatoes. Don't get me wrong, I do love me a good batch of Chanukah latkes, but sometimes, just sometimes, I don't feel like smelling like a deep fryer for days on end. 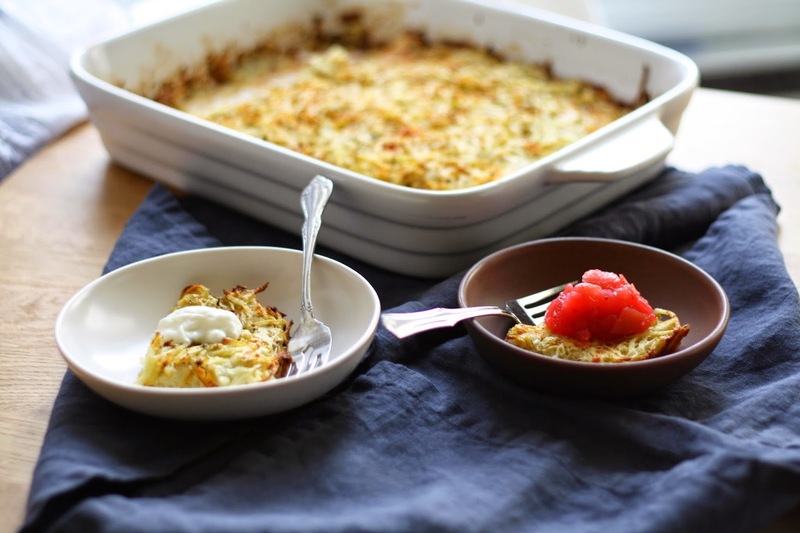 Potato kugel is very similar in flavour and texture to a latke, just a whole lot easier to make. 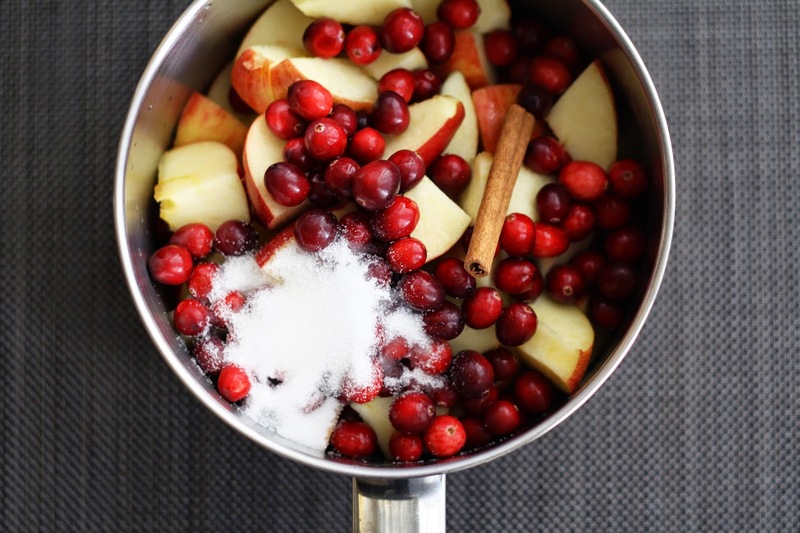 Top it with a cranberry infused apple sauce, and you have yourself a perfectly festive holiday appetizer. I made mine in a rectangular casserole dish, producing a thinner then average (but crispier) kugel. This recipe can easily be made in a 9x9, yielding a thicker result. Choose whichever you prefer. Using a grater or food processor fitted with the grating blade, grate your potatoes and onion. In a large bowl, whisk the egg, flour, salt and cumin. Add the drained potato/onion mixture and mix well to combine. Spread 2 T of oil in your casserole dish, a warm for 2 minutes in the oven. Remove from the oven, and carefully transfer the mixture into the dish. Drizzle with the remaining 1 T oil and a generous sprinkle of paprika and fresh ground pepper. Bake for 1 hr, or until nicely browned. 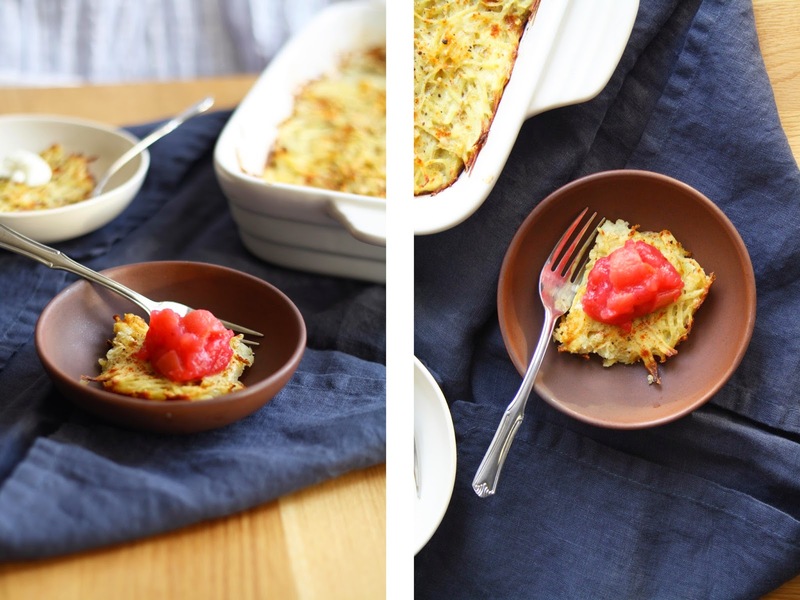 While the kugel is baking, make the cranberry applesauce. Combine all the ingredients (except the lemon juice) in a medium saucepan. Bring to a boil, and then reduce the heat to a simmer. Cover and allow to cook for 30-40 minutes, or until desired consistency is reached. Stir often along the way to avoid sticking. Once ready, remove from the heat and stir in the lemon juice. 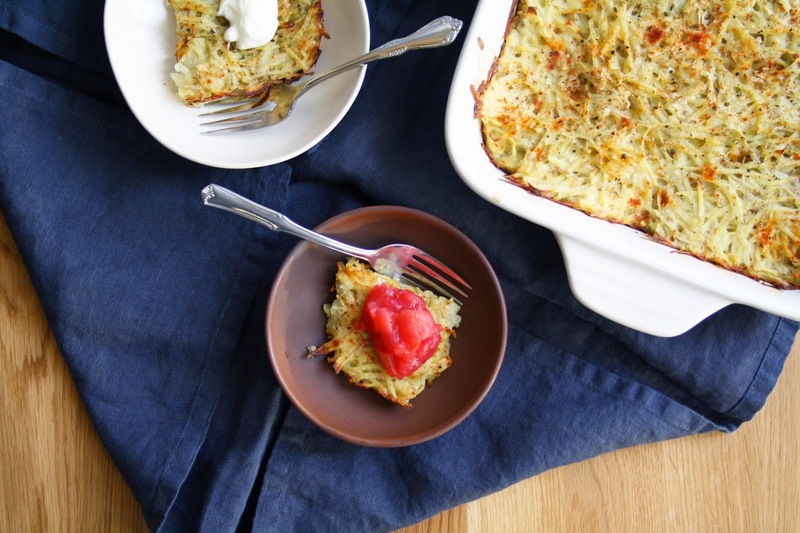 To serve, cut the kugel into squares and top with cranberry apple sauce, and/or sour cream. Best served warm, right out of the oven.